Blue Ledge Co-op sits quietly in a wooded setting area in the heart of the city of Roslindale, Massachusetts. 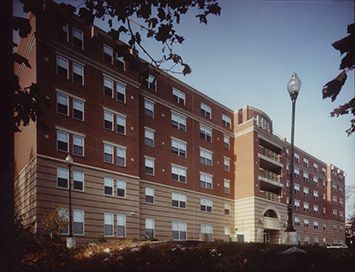 This 80-unit development opened in 1995 and is on a site that is the highest point in the City of Boston. Relaxing on the 6th floor balcony one can enjoy the sights of Boston’s picturesque city skyline in the near distance while taking in good conversation with friends and neighbors alike. Blue Ledge Co-op, is a senior community that straddles both bustling city and bucolic suburban atmospheres. Designed for resident members aged 62+, Blue Ledge Co-op is nationally recognized as “A Community of Quality” by the National Affordable Housing Association. Blue Ledge is gradually transforming into a 100% smoke free co-op. While no one is allowed to smoke in any common area and within 25 feet of the building, there are approximately five members who are still permitted to smoke in their own apartments because they signed a waiver prior to the full implementation of the new smoking rules. All new members as of July 1, 2013, are not allowed to smoke inside their own apartment. Whether enjoying quiet moments in their apartments, lively potlucks in their community room, or social gatherings in their various lounges, members have every amenity at their fingertips. Bus stops are conveniently located just steps from the front door with colorful Roslindale Square down the hill to the right offering eclectic restaurants, boutiques and shops, and West Roxbury and Dedham up the hill to the left with its many parks and bike paths. Blue Ledge is affordable for everyone. Every unit has subsidy and resident members pay only 30% of their income for rent. Blue Ledge Co-op is proud to be recognized as a NAHMA Communities of Quality Corporate Partner. This designation is for multifamily properties that have achieved a high standard of excellence in the way they are managed, the services they provide residents, the experience and training of personnel, and other criteria.